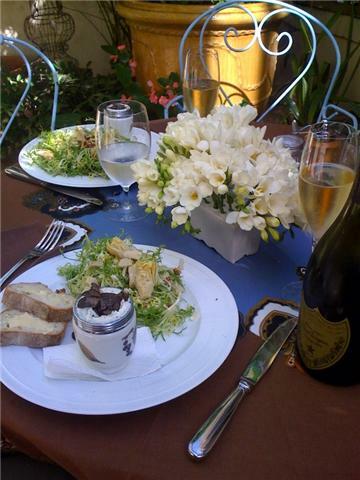 What could be better on a sunny Los Angeles Valentine’s day than an impromptu al fresco brunch? I made a simple frisee salad with white balsamic vinaigrette, pecans, and parmesan shavings to accompany the coddled eggs with shaved black Perigord truffle all washed down with a fine glass of Dom Perignon. To make coddled eggs, firstly, one needs egg coddlers. Egg coddlers are porcelain cups with metal screw-on lids and a ring at the top. They may be difficult to find. Mine are from Royal Worcester, who I believe invented the egg coddler. Butter the inside of the cup. In the bottom, I put a little cheese. This time I used Boschetto, a truffle cheese from Italy. In go two eggs, then a splash of cream and some salt and pepper. The lid is then tightly screwed onto the egg cup and the cups are lowered into a saucepan of gently boiling water. I boil them for about 8 or 9 minutes, so the yolks are still runny but the whites set. I top them off with shaved black truffle. Served with crusty bread, Heaven! Here’s hoping your Valentine’s day is filled with delicious moments! Delightful_ what a pity we could’nt accept your invite to lunch sounded divine but with ten hours flight between us the eggs would have been more than coddled give us a little more notice next time?